Describe channels for customer support. Turn questions from the Web into cases. Consider Email-to-Case or On-Demand Email-to-Case. As mentioned in the Introduction to the Service Cloud, the first step towards delivering extraordinary customer service is giving your customers a choice in how they communicate with your company. The different ways your customers can reach out to your company are called channels, and they can include something as traditional as a phone number to something as revolutionary as video conferencing on a mobile app. Why give your customers more than one communication channel? Well, think about how many channels are on TV. Each channel gives an audience shows that they want to watch. Some audiences want to watch sports while other audiences want to watch soap operas. At times, you probably find yourself flipping through various TV channels until you find the show that you want to watch based on your mood. Now imagine that you only had one TV channel. How would you feel? Probably bummed out or even irritated because you wouldn’t have any choices. With the Service Cloud, you can give your customers a variety of choices with how they can reach out to your company—by phone, email, website, social media, online communities, you name it. First, we’ll set up two of the most common channels, then we’ll explain some of the more advanced channels for you to explore on your own. How many times have you gone to the Web to solve a problem? When was the last time you went to a company’s website to figure out why something you bought wasn’t working as it was supposed to? Probably pretty recently, right? Customers expect a Web presence. From the comfort of our homes, or from the convenience of our cubicles, it’s a given that you can get support online. Web-to-Case is an easy way to create online support. Essentially, it’s a form of case fields that customers fill out and submit to agents. Web-to-Case helps your team gather service requests from your company’s website and automatically generate up to 5,000 new cases a day. Here’s how Web-to-Case works: (1) you decide which case fields display on the form; (2) you generate the HTML for the form; (3) you send the HTML to your web developer who puts the form on your company’s website, and, voila, customers start sending your agents cases. Let’s set this up! From Setup, enter Web-to-Case in the Quick Find box, then select Web-to-Case. Deselect Require reCAPTCHA Verification. We’re not going to cover reCAPTCHA here. Choose a default case origin, such as Web. Select a response template to automatically notify customers that their case was created. Remember, great service is letting customers know that their voice is heard! Pick any template to see how this works. Click Hide Record Information to prevent case information from appearing in the email sent to customers—this is only in the unlikely event that a case fails to create. If you’d like to use an email signature that’s different than the one in the response template, enter a new signature. Now you’re ready to generate the HTML form to send to your web developer. From Setup, enter Web-to-Case HTML Generator in the Quick Find box, then select Web-to-Case HTML Generator. Add the case fields you want on the form. If your organization uses multiple currencies, add the Case Currency field, otherwise all amounts are captured in your corporate currency. 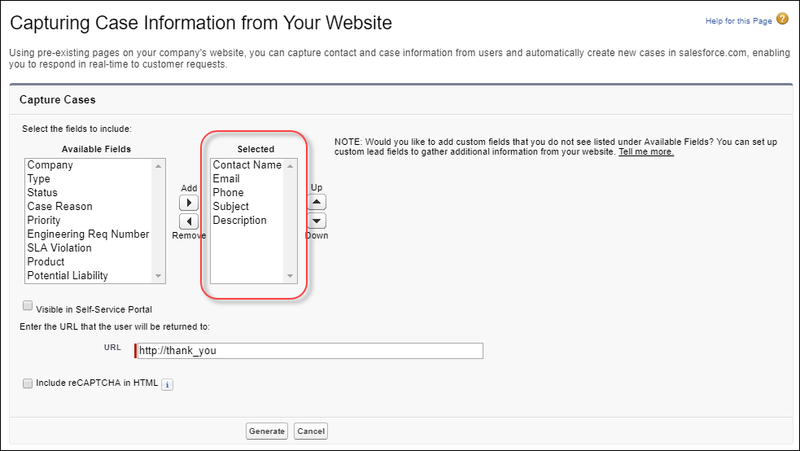 If you set up an online portal for your company, you can click Visible in Self-Service to let cases created from the Web form appear to portal customers. Enter the URL to appear after customers submit their case, such as a “thank you” page. If Include reCAPTCHA in HTML is selected, deselect it. We’re not going to cover reCAPTCHA here. Copy the HTML code and send it to your web developer to post on your website. That’s it! Your online support presence is established. Customers can reach out to your support team at their convenience and create cases over the Web. How many emails do you read or send each day? Like most people, you probably work and live around the emails flooding your inbox. You probably have email access on your mobile phone and expect to contact almost anyone on Earth by clicking a Send button. Your customers are no different. They expect to contact your support team through email. You can easily provide your customers with email support when you set up one of Salesforce’s Email-to-Case options. Keeps all email traffic within your network’s firewall. Accepts email attachments larger than 25 MB. Requires downloading and installing the Email-to-Case agent to your network. Sends all email traffic outside of your network’s firewall. Accepts email attachments smaller than 25 MB. Uses Apex email services to convert email to cases. Whether you want to use Email-to-Case or On-Demand Email-to-case comes down to your company’s email security policy, and the email attachment size that you’d like your team to handle. To keep things simple, we’re going to use “Email-to-Case” interchangeably with “On-Demand Email-to-Case.” The latter includes too many syllables to read over and over again, but if any differences between the two come up, we’ll point them out. Since your company’s network and firewall are unique and tricky things, let’s avoid them and set up the on-demand version of Email-to-Case. In a nutshell, setting up Email-to-Case includes: (1) Turning it on; (2) configuring settings and an email address for your customers; (3) Verifying that the address converts emails to cases; (4) adding the email address to your company’s website so that customers can email your team. From Setup, enter Support Settings in the Quick Find box, then select Support Settings. Click Edit, and choose a default case owner and automated case user. This makes sure that each case that comes in is assigned an owner and not lost in a technological void. You can make the owner a queue or a person. 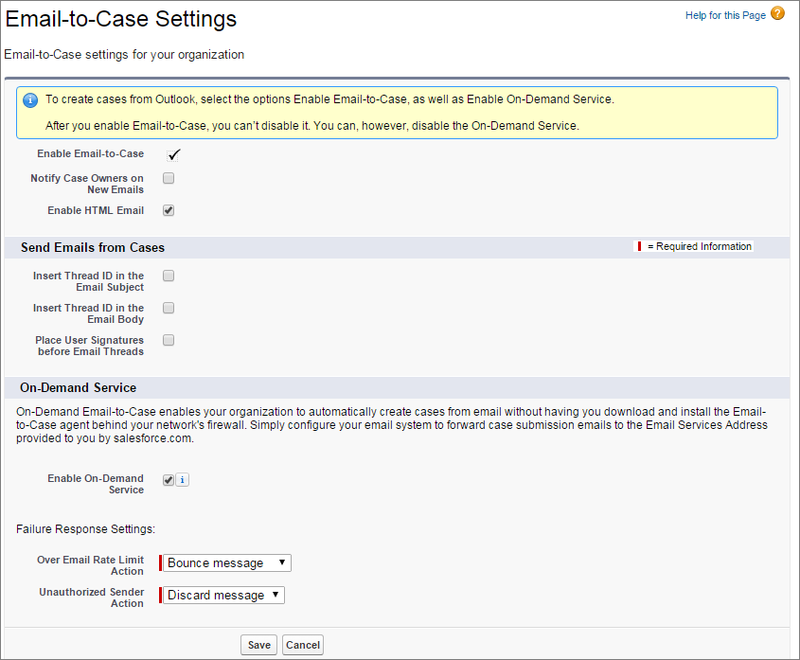 From Setup, enter Email-to-Case in the Quick Find box, then select Email-to-Case. Click Edit, and select Enable Email-to-Case and Enable On-Demand Service, then click Save. The other settings on the page determine how email content gets processed. Next to Routing Addresses, select Email2Case and click New. Enter an email address at which your customers can reach your support team, and give it a name. This is the address that will route emails directly to Salesforce and converts them to cases. Choose the Priority and Origin for cases converted from emails, and click Save. The other settings on the page are optional. Confirm your email routing address by checking its inbox for a Salesforce verification email. Or, click Verify next to the routing address on the Email-to-Case Routing Address page. Click the link in the verification email, and Continue to confirm. 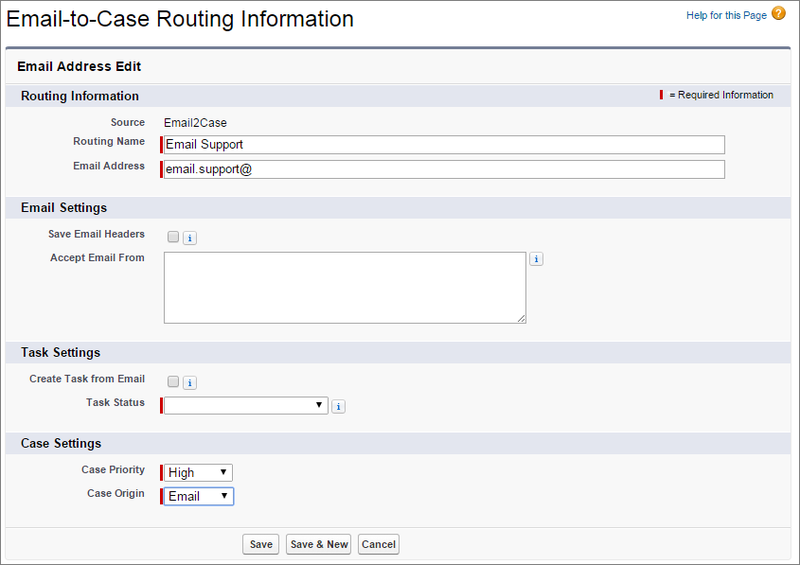 Return to the confirmed routing address by clicking Customize | Cases | Email-to-Case. Notice that Salesforce generated an email services address for your routing address. Configure your email system to forward messages from your routing address to the email services address. Test your routing address by sending an email to it and verifying that the email converts to a case. You might have to search for the case on the Cases tab. Once you verify that emails sent to the routing address are converted to cases, you can send the address to your company’s Web developer to add to your site. Pretty simple, huh? Now your service team has a bona fide email channel. Salesforce helps you quickly create many more channels than just Web and email. Since those channels are the most popular for customers and service teams, we started with those first. But as you plan your support process, consider other channels that might make your customers even happier. Also, take a look at the service choices that your competitors offer. Does your team offer your customers the same channels as your competitors? Maybe you can give your customers better, faster service with more advanced channels. More advanced channels doesn’t mean more stress or context-switching for your support agents. Because Salesforce gives your team a unified help desk to answer all customer questions from one screen (the console, which you’ll learn about in the next module) it doesn’t matter how many channels you implement. To your team, each question arrives as a case. Whether cases come in as emails or phone calls, they appear virtually the same in Salesforce to your agents. Plus, with the Service Cloud, any agent can work on any case from any channel, so your team is immediately set up for success. To help you plan your overall support process, it’s important that you understand some of the other channels you can set up to wow your customers without overwhelming your agents. For now, we’ll describe some other channels for you to consider. But we’ll cover them in more detail in later modules. Some customers want to pick up their phones and talk to an agent immediately. Hearing the human voice and talking through more complex service situations is ideal support for some. With Salesforce Call Center, you can turn phone calls into cases, and your agents can log call details with just a few clicks. With each call, Salesforce pops up critical customer data on screen so that your agents know who they’re speaking with and can close cases faster. And you can integrate data from third-party systems with calls to match your business needs. Imagine if your customers could click a button on your company’s website to initiate a chat with a live agent. Think of how quickly your team could answer customer questions with instant text chat. That’s what Live Agent can do. Consider this channel as a way to improve first response times and reduce customer frustration from waiting for answers from other channels. What if your customers could answer each other’s questions? Think about how an online forum and community for your customers could improve service times, raise visibility about unknown issues to your team, and build customer trust when your agents contribute to online conversations. Salesforce communities is a channel that does all that and so much more. The world is mobile and customers turn to their mobile devices for support. Instead of just providing your customers with mobile content, imagine giving them an in-app channel with video conferencing, screen sharing, and guided assistance. That’s what Service on Salesforce (SOS) can do for you. 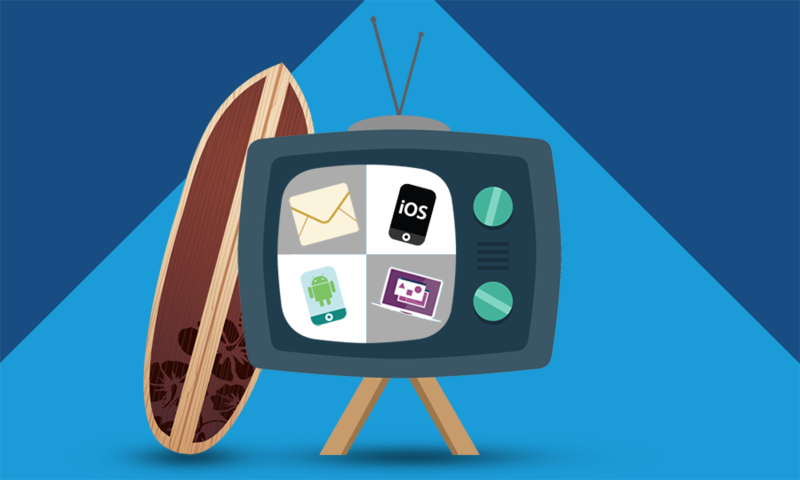 Offer a channel that impresses your customers with cutting edge technology.